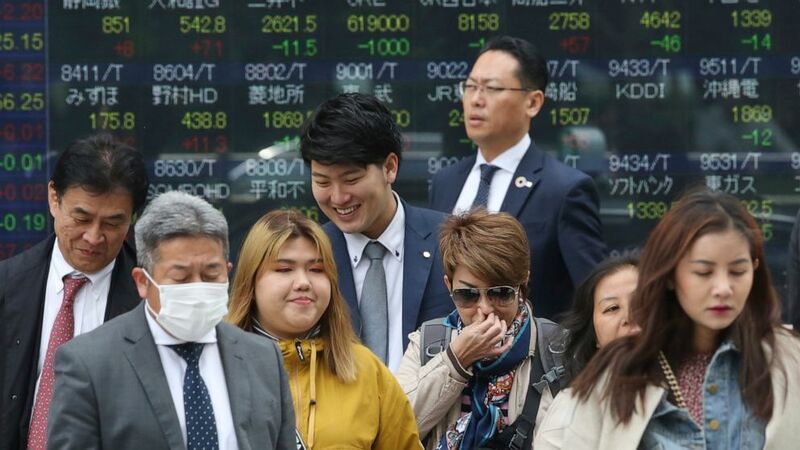 Major share benchmarks were mixed in Asia on Wednesday after China announced its economy grew at a better than expected 6.4 annual pace in the last quarter. Japans Nikkei 225 index gained 0.3 to 22,277.97 and the Shanghai Composite added 0.3 to 3,264.67. Hong Kongs Hang Seng index edged 0.1 higher to 30,152.11 while the S&P ASX 200 in Australia lost 0.3 to 6,257.20. Chinas 6.4 pace of economic expansion in January-March was in line with Beijings official annual target for 6-6.5 growth and suggests government efforts to halt a slowdown are working. Its not entirely clear what is behind this strength. Growth in industrial sales for export edged up last month from 4.2 year-on-year to 5.7 but doesnt stand out as especially strong, Julian Evans-Pritchard of Capital Economics said in a commentary. Domestic demand has picked up too, but likewise, the gains appear more modest than those in industrial output, it said. Meanwhile, Japan released trade data for March showing its exports fell 2.4 from a year earlier, while the trade surplus sank 33. Analysts said the figures suggest demand overall remains weak. Qualcomm powered technology sector stocks higher, gaining 23.2 in its best day in 20 years, on news the chipmaker and Apple had settled their bitter legal dispute centered on some of the technology that enables iPhones to connect to the internet. The surprise truce announced late Tuesday afternoon came just as the former allies turned antagonists were facing off in a federal court trial that was supposed to unfold over the next month in San Diego. The resolution abruptly ended that trial, which also involved Apples key iPhone suppliers. The S&P 500 rose 0.1 to 2,907.06. The Dow Jones Industrial Average gained 0.3 to 26,452.66. The Nasdaq composite added 0.3 to 8,000.23. The index had not closed above 8,000 points since October. The Russell 2000 index of small-cap stocks picked up 0.2 to 1,582.79. The markets are prepared for this year-over-year decline that everyone is expecting in earnings, said Erik Davidson, chief investment officer at Wells Fargo Private Bank. Unless we have some significant misses, we should be doing OK. The yield on the 10 year Treasury note rose to 2.59 from 2.55 late Monday. The 10 year Treasury yield has been climbing since late last month, when it fell to 2.37 amid a crescendo of worries that global economic growth was slowing. ENERGY: Benchmark U.S. crude oil rose gained 48 cents to 64.53 per barrel in electronic trading on the New York Mercantile Exchange. It gained 1 to settle at 64.05 per barrel on Tuesday. Brent crude, the international standard, added 34 cents to 72.06 per barrel. It picked up 0.8 to close at 71.72 per barrel in London. CURRENCIES: The dollar slipped to 111.99 Japanese yen from 112.01 yen. The euro strengthened to 1.1311 from 1.1282. April 17, 2018 Comments Off on Does vaginal seeding boost health?